a class of drugs with the capacity to prevent calcium ions from passing through biologic membranes. These agents are used to treat hypertension, angina pectoris, and cardiac arrhythmias. a drug that inhibits the flow of calcium ions across the membranes of smooth muscle cells. By reduction of the calcium flow, smooth muscle tone is relaxed and the risk of muscle spasms is diminished. Calcium channel blockers are used primarily in the treatment of heart diseases marked by coronary artery spasms (e.g., variant angina). A class of cardiovascular drugs with the capacity to prevent calcium ions from passing through biologic membranes (e.g., cardiac muscles and blood vessels). These agents are used to treat hypertension, angina pectoris,and cardiac arrhythmias; examples includenifedipine, diltiazem, and verapamil. A drug that relaxes blood vessels and lowers blood pressure. Drug that stops calcium ions from passing through biologic membranes; used to treat hypertension, angina pectoris, and cardiac arrhythmias. a drug, such as nifedipine or verapamil, that selectively blocks the influx of calcium ions through a specific ion channel (the slow channel or calcium channel) of cardiac muscle and smooth muscle cells; used in the treatment of cardiac arrhythmias. 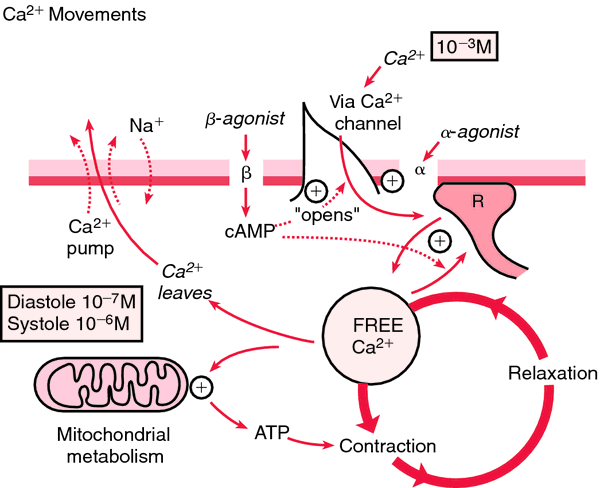 Calcium channel blockers act to control arrhythmias by slowing the rate of sinoatrial (SA) node discharge and the conduction velocity through the atrioventricular (AV) node. Called also calcium blocker, calcium antagonist. Patients on a combination of calcium channel blocker and beta blocker were also excluded from the study, to avoid the confounding effect of beta blocker as a cause of bleeding or purpura. Treatment for calcium channel blocker poisoning: a systematic review. It is due to the fact that Verapamil, a well known calcium channel blocker inhibits the calcium influx, which may be responsible for the observed reductions in volume and acidity of gastric secretion. The use of corticosteroids in addition to calcium channel blockers has been examined. The same relationships seen when NT-proBNP was measured at rest held true when the biomarker was measured at peak exercise or during recovery: Mean levels were significantly reduced compared with baseline if patients were on calcium channel blockers for rate control, and significantly elevated above baseline while they were on beta-blockers. In 2002, the eighth most prescribed drug in the United States was amlodipine, a calcium channel blocker, and several other types of calcium channel blockers are also found among the top 100 prescription drugs (Mosby's Drug Consult, Online). If these measures prove to be ineffective, a calcium channel blocker can be prescribed. It's very hard to design a calcium channel blocker that is going to work for just one channel," notes Benoff. SYST-EUR, a major clinical trial on the calcium channel blocker (CCB) nimodipine found that subjects receiving the drug experienced 42% fewer strokes and 31% fewer cardiac events. NASDAQ: ZLCS), a biopharmaceutical company that discovers and develops novel treatments for patients suffering from pain and immuno-inflammatory diseases, today announced that it is has initiated a Phase 1 multiple ascending dose (MAD) clinical study with Z944, its novel, oral, T-type calcium channel blocker.